This page is intended to provide answers to some of the questions you may have about lure coursing with your Borzoi and provide an overview of the sport. Lure Coursing is an ASFA (American Sighthound Field Association) or AKC (American Kennel Club) sanctioned competition, where a minimum of 500 yard zigzag course is set up with pulleys staked to the ground to form the turns. The lure is made of several plastic strips (usually white garbage bags) attached to a line, which is run through the pulleys to form the course. At the end of the line is a machine that will either run in the line on a reel, or form a continuous loop to move the lure at variable speeds up to 50 mph. In order to simulate running game, the lure speed is controlled by the lure operator with a switch that is wired to the lure machine. At the signal of the huntmaster, the lure is started and the lure operator attempts to keep the lure 10-30 yards in front of the hound(s) at all times. The lure will be stopped at any time a hound becomes entangled in the line or a dangerous situation develops. How Did Lure Coursing Begin? The Borzoi originated as a coursing hound (sighthound); a dog used for the pursuit of running game, i.e. wolves, fox and hare, over the Russian steppes. They followed game by sight and relied on speed, agility, endurance and strength to hold or dispatch prey when caught. This form of hunting reached its peak in the late nineteenth century. Borzoi have been used to hunt various other types of game throughout the twentieth century. In the early 1970s, lure coursing was developed to provide a forum for sighthounds to compete, without the problems associated with coursing live game. Although it artificially simulates coursing it does provide a format to measure and develop the characteristics of sighthound breeds. The individual who really believed in lure coursing and took the effort to get the sport going was Lyle Gillette, who in 1971 went around the country demonstrating the sport to groups of Borzoi owners interested in coursing their dogs. These demonstrations were met with a great deal of enthusiasm by the participants. In 1972 the National Provisional Committee was formed, and this committee because the American Sighthound Field Association (ASFA). In 1975, ASFA established rules regarding the conduct of lure courses, judging and established a point and title system for the sport. As a response to those who wished to compete under the sanction of the American Kennel Club, the AKC was petitioned to recognize lure coursing as they do hunting tests, point trials and herding tests. Rules regarding the conduct, judging, point and title systems for AKC sanctioned events were adopted in September, 1991. Today you may lure course your Borzoi in both ASFA and AKC events, and earn titles from both organizations. How Do I Select a Borzoi for Lure Coursing? Many factors must be considered beyond those solely given for the selection of a coursing Borzoi. These topics are addressed and discussed in the Borzoi Club of America's Guidelines for Breeders of Borzoi and So, You Want A Borzoi . (a) Is the puppy outgoing and active? (b) Does the puppy seem to get along with littermates and other adult dogs? (c) When baited with a lure tied to a buggy whip, does the puppy show a keen interest in the lure and try to chase and catch it? (d) For its age, does it have a good attention span? Can My Borzoi Get Injured? The possibility of injury exists in any competitive sport. However, every precaution is taken to minimize the risk to your Borzoi. In addition, as with all competition athletes, proper condition, nutrition, warm up and cool down will greatly minimize the possibility of injury. How do I Get Started in Lure Coursing? The best way to get started in lure coursing is to attend a couple of lure coursing trials or practices and ask questions. The people who participate in this sport are more than willing to help out newcomers. By attending a few times without competing you will have an opportunity to watch what goes on, and get pointers on how to get started. How do I Begin Getting My Borzoi Ready to Compete? When conditioning the young dog, you should use good judgement and not over train the puppy. Borzoi are still growing, maturing up to 18 months of age and beyond. A good aerobic training program that starts out easy (brisk walks) and is gradually increased in time and distance works as well on dogs as it does on people. Use care and not over train your dog. Try to avoid rough surfaces such as pavement and frequently check the dog's pads for wear or injury. Take time to get your puppy properly acclimated to lure coursing by taking him to matches, practice courses and lure courses where he is not going to compete. This will give the puppy an opportunity to get used to all of the excitement, and to be around dogs of many different breeds and temperament, without the pressure of having to compete. 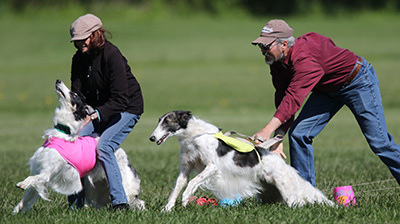 After lure coursing events the host club may offer to run the lure for practice. It is a good idea to take advantage of these opportunities to practice, and also get some good advice on getting your dog ready to compete. Start out with a short straight-away. Gradually introduce your Borzoi to a course where the lure turns. Do not practice your Borzoi when he is tired or when the weather is uncomfortable for your Borzoi. 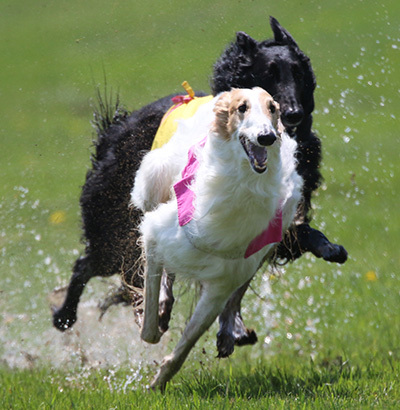 Make lure coursing fun for your Borzoi. Is Any Equipment Required for Lure Coursing? A slip lead made of leather or webbed strap with a wide collar and double or single rings is the minimum equipment you should have. Clubs usually have slip leads as well as coursing blankets, you can use. Once your Borzoi is chasing the lure and ready to compete in events, you will find it more convenient to have a bright yellow blanket, bright pink blanket and a bright blue blanket that fit your Borzoi. Properly fitted muzzles are strictly optional. No other collars or other paraphernalia will be permitted on your Borzoi while he is running. Is My Borzoi Eligible to Compete? For both ASFA trials and AKC tests and trials, your purebred Borzoi must be one year of age and be registered with the AKC, an AKC recognized foreign registry or have been granted an Indefinite Listing Privilege (ILP). Spayed and neutered Borzoi are eligible to compete. Monorchid and cryptorchid Borzoi cannot compete in AKC events. How Can My Borzoi Earn AKC Coursing Titles? To earn the Junior Courser (J.C.) title, enter the Junior Courser test. Your Borzoi has to run alone and compete at least a 600 yard course with a minimum of 4 turns, chasing the lure with enthusiasm and without interruption. Your Borzoi has to pass the Junior Courser test twice, under two different judges. The additional AKC titles are earned at AKC trials, by entering the Open stake. If your Borzoi is 6 years or older, he can be entered in the Veteran-open stake. To enter the Open stake (or Veteran-open stake) for the first time, the Borzoi must be an AKC Junior Courser and have successful practice experience running with other Borzoi. Borzoi who are disqualified from AKC, ASFA or CKC field trials may not be entered. All hounds of the same breed run in either the Open stake, the Veteran-open stake or the Specials stake in trios, if possible, or braces for a preliminary course and a final course. The scoring and placing of winners is based on the following qualities: Overall Ability - 10 points, Follow - 10 points, Speed - 10 points, Agility - 10 points and Endurance - 10 points for a maximum of 50 points for each course the Borzoi runs. The score for the preliminary course and the score for the final course are added together for a total score that determines the placements in that stake. If two or more hounds are tied for a placement, there will be a run-off to determine the winner, or an owner can forfeit the placement. To earn the Senior Courser (S.C.) title, your Borzoi must run, at 4 trials, with at least one other hound, and get qualifying scores. A qualifying score is 50% or more of the total available points from the judges. At these same trials, if your Borzoi also wins a placement, he can earn points towards his Field Champion title. If your Borzoi wins first place, you can run him for Best of Breed competing with the first place winners of the other stakes. If your Borzoi is tired, you can choose to forfeit Best of Breed. If your Borzoi wins Best of Breed, you can, if you choose to, run him in the Best of Field run. If your Borzoi wins Best In Field, he gets points towards his Field Championship based on the largest breed entry that day. To earn a Field Champion (F.C.) title, your Borzoi must earn 15 points, and have 2 first placements worth 3 points or more under 2 different judges or judging panels. Points are earned for first, second, or third place depending on the number of Borzoi competing in the stake. When there are 10 or more Borzoi competing, the first place Borzoi earns a 5 point major, the second place Borzoi earns 3 points (but not a major) and the third place Borzoi earns 2 points. When there are 8 or 9 Borzoi competing, the first place Borzoi earns a 4 point major, the second place Borzoi earns 2 points and the third place Borzoi earns 1 point. When there are 5, 6 or 7 Borzoi competing, the first place Borzoi earns a 3 point major and the second place Borzoi earns 1 point. When there are 3 or 4 Borzoi competing, the first place Borzoi earns 2 points. When there are 2 Borzoi competing, the first place Borzoi earns 1 point. The Borzoi awarded Best of Breed (by winning the Best of Breed runoff or by forfeit) gets points equal to the total number of Borzoi competing in the Open stake, the Veteran-open stake and the Specials stake. A Borzoi who has earned his Field Championship can be entered in the Specials Stake where he can compete for the Senior Courser, Master Courser and Lure Courser Excellent titles. To earn the Master Courser (M.C.) title, your Borzoi must complete the Senior Courser title, and then run at 25 additional trials (in either Open, Veteran-Open or Special stake), with at least one other hound, and get qualifying scores. The Junior Courser, Senior Courser and Master Courser titles go after the dog's registered name. The Field Champion title goes in front of the dog's registered name. A hound who has earned 45 championship points after being awarded the title of Field Champion, would be awarded the suffix title of Lure Courser Excellent. The title would additionally be a cumulative title each time the dog accrued 45 champion points (LCX II, LCX III, etc.). How Can My Borzoi Earn ASFA Titles? To be eligible to enter the Open stake for the first time, the owner must submit the ASFA Certification form. An ASFA Certification form is signed by a licensed judge who watched the Borzoi complete one course of at least 500 yards, running with another Borzoi (or another breed with a similar running style). Your Borzoi must chase the lure and demonstrate no inclination to interfere with the other hound. Your Borzoi must be at least 11 months old for this certification test, which can be done at a coursing practice. Your Borzoi does not need this test if he already has a lure coursing or racing title requiring competition from another recognized organization (such as an AKC Senior Courser title). The owner signs the "Waiver of Requirement" part of the ASFA Certification form listing what lure coursing or racing title his Borzoi has earned, a copy of the title certificate and submits these forms along with his entry form at the Borzoi's first trial. To be eligible to enter the Veteran stake, the Borzoi must be at least 6 years old, and have competed in the Open stake, or the owner must submit the ASFA Certification form. All hounds of the same breed run in either the Open stake, the Veteran stake or the Field Champion stake in trios, if possible, or braces for a preliminary course and a final course. The scoring and placing of winners is based on the following qualities: Enthusiasm - 15 points, Follow - 15 points, Speed - 25 points, Agility - 25 points and Endurance - 20 points for a maximum of 100 points for each course the Borzoi runs. The score for the preliminary course and the score for the final course are added together for a total score that determines the placements in that stake. If two or more hounds are tied for a placement, there will be a run-off to determine the winner, or an owner can forfeit the placement. Championship points are awarded to the first through fourth placements in Open, Veteran and Field Champion stakes. First Place is worth 4 times the number of Borzoi competing in the stake with a maximum of 40 points. Second Place is worth 3 times the number of Borzoi competing in the stake with a maximum of 30 points. Third Place is worth double the number of Borzoi competing in the stake with a maximum of 20 points. Fourth Place is equal to the number of Borzoi competing in the stake with a maximum of 10 points. A hound who wins the Best of Breed run-off, is awarded points equal to the points awarded the highest placing hound in that breed which it defeated, and is credited with a first placement in a stake. To earn the Field Champion (F.CH.) title, the Borzoi must have earned 100 points and two first placements or one first placement and two second placements in the Open Stake. A placement counts only if the Borzoi defeated another Borzoi who received a qualifying score. To earn the Lure Courser of Merit, the Borzoi must be a Field Champion and have earned 300 points and have won 4 first placements (over placing hounds) in the Field Champion Stake. After earning a LCM, the Borzoi may continue to earn additional titles (LCM II, LCM III, etc). To earn the Veteran Field Champion (V-FCH) title, the Borzoi must have erned 75 points and two first placements or one first placement and two second placements, in the Veteran Stake. To earn the Veteran Lure Courser of Merit (V-LCM) title, the Borzoi must first earn the Veteran Field Champion title and continue to compete and receive 4 first placements (over placing hounds) and 200 more points in the Veteran Stake. All ASFA titles go after the Borzoi's registered name. If your Borzoi wins first place in his stake, you can, if you choose to, run him for Best of Breed competing with the first place winners of the other stakes. If your Borzoi wins Best of Breed, you can, if you choose to, run him in the Best of Field run (if the all-breed club is offering it). No championship points are awarded; however the hound who wins Best In Field is credited with a first placement in a stake. Who Do I Contact to Find Out More About Lure Coursing or the Location of Practices or Trials in My Area? Contact one of the regional Borzoi Clubs. Schedule of AKC coursing events lists of coursing clubs and lure coursing rules and regulations are available on the American Kennel Club web site and from the AKC, 5580 Centerview Drive, Raleigh NC 27606-3390. Schedule of ASFA events and lists of coursing clubs are available on the American Sighthound Field Association web site and in the American Sighthound Field Association bi-monthly published Field Advisory News, P O Box 399, Alpaugh CA 93201. BLANKET - A solid colored cloth worn by each hound during competition. Approved colors are bright yellow, bright pink and bright blue. COURSE - Is the actual pursuit of the lure over a selected course by one, two or three hounds. Courses begin when the huntmaster receives an affirmative response to "Are you ready?" by the handlers, and ends when the hounds are back under their handlers control. COURSE DELAY - A course delay will be called when handlers hounds delay the beginning of a course by breaking away before the signal "Are you ready?" or avoid their handlers after the command, "Retrieve your hounds." DRAW - A random drawing to determine the order in which hounds will be run. HUNTMASTER - The official in the hunt who sounds the release and is in charge of all hounds and their handler. INTERFERENCE - The intentional disruption or impeding of a hound in the course by another hound. Bumping to get at the lure is not interference. NO COURSE - A course that terminates prior to the end of the course. This ruling also includes any situation in which the judges deem that a hound did not receive the opportunity for a fair evaluation. PRE-SLIP - When a handler slips the hound prior to the "T" in "Tally-Ho" being given by the huntmaster. QUALIFYING SCORE - Fifty per cent (50%) of the total possible combined points from the preliminary and final courses. RUNOFF - A competition to determine a final placement in the event of a tie. STAKE - Separation of entries within a breed, based on specific qualifications. REGULATIONS OF LURE COURSING TESTS and TRIALS , American Kennel Club, 5580 Centerview Dr, Raleigh NC 27606-3360. REGULATIONS FOR LURE COURSING TRIALS , American Sighthound Field Association. THE COMPLETE BORZOI , Lorraine Groshans, 1981, published by Howell Book House Inc.